An Old Literary Friend Re-visited. Today Minna and I have settled in at Edisto Island Beach State Park—a palmetto-lined beach famed for its sea shelling, long soft-sandy beach, maritime forest and proximity to Toogoodoo Creek. Only an hour from Charleston SC, the park is divided: Section I—campsites deep in the maritime forest of live oaks, with some of the South Carolina’s tallest palmetto trees and a front-row view of miles of pristine marshland. 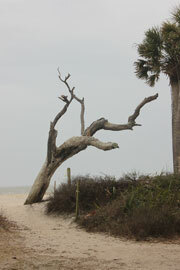 Section II is comprised of beachfront campsites protected from ocean winds by a huge long dune. The property is divided beachfront to maritime forest by one of the nation’s largest preserved estuaries where heron, pelican, egrets, too many small marsh birds to name, and a large population of feral cats call home. It has been raining off and on today but as I speak the sun pokes through and says “toodoogoo” an indian word that I have not yet found the exact meaning of but is the fascinating name of a nearby creek, sounding strangely aboriginal to me. On this rainy day, sorting out some of the subjects I have saved for blogging on this adventure seems to be a productive task. Some time back I discovered Thomas Wentworth Higginson. Higginson is the writer I would emulate if I should try emulate one. He sounds more like John Muir than John Muir. Though perhaps much more of a stuff shirt. None-the-less I enjoy reading his work and offer it to you today in hopes of brightening your spirits as much of the eastern part of America is being pummeled by winter storms. Snow up to 22 inches in Washington DC and scouring rain in the south. I am so glad I made it to the warmer Charleston weather before the storm. the answering beauty of the Water-Lily. Waterlilies I photographed at Giverney, France in Monet's Garden. If you care to make a comment on any of my posts click the comments button at the title and a window will open for you to enter your comment. 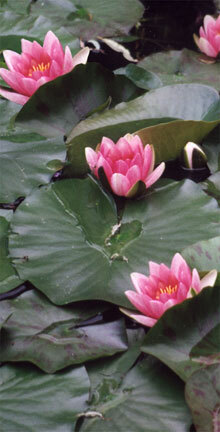 The Waterlilies photo is very painterly and the poem so evocative.